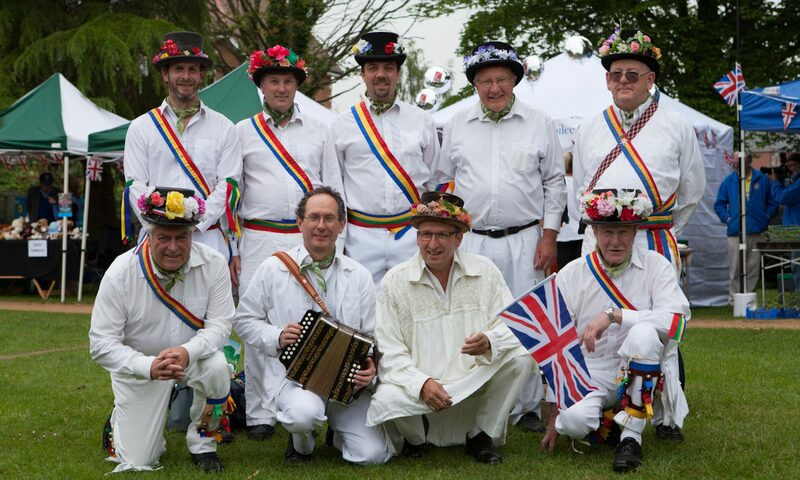 The team was formed in 1978, this was with local men who had previously danced with the Abingdon Morris and also with other men who were either born locally or have resided in the town for many years. The team has connections with a long line of Abingdon Morris dancers going back many generations and decided to take their name from an earlier dancer “Tom Hemmings”, it is in recognition of his effort and contribution to the Abingdon Morris that the present team decided to call themselves “Mr Hemmings Traditional Abingdon Morris Dancers”. Also documented are “Royal” versions of Maid of the Mill and Jockey to the fair which were performed at Sidmouth Folk Festival in 1983. The team performs during the summer months from May to September, usually at local fetes, pubs and with other morris sides around the area. On May the 6th, we dance along Ock Street to celebrate Tom Hemmings’ birthday. During the summer, we have a day of dance around Abingdon with other morris sides often joining us on the day. Please see the diary for this years events. We practice during the winter at the Royal British Legion Club, Spring Road, Abingdon on Monday evenings at 8pm between November and April.